YouView app launches with TV listings and remote record | What Hi-Fi? 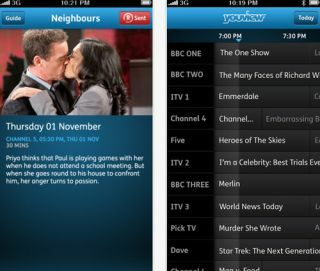 YouView has launched its first app, bringing TV listings and remote record functionality to the iPad, iPhone and iPod Touch. The YouView app is available for free today and works with all the YouView set-top boxes on the market. Full 7-day listings for over 70 digital TV and radio stations are available, while you will be able to set your YouView box to record programmes when you're on the move. Richard Halton, Chief Executive Officer, YouView says, "We are really excited about our new YouView App – it gives customers a new way to find the content they love and the flexibility to record programmes on the go. "This is just the first stage in our companion device strategy, offering even more value to UK consumers, and we plan to extend the functionality of this app as part of our on-going development of the YouView proposition." YouView launched in July this year, backed by Lord Sugar and promising an easier way to view programmes and access catch-up TV internet services from BBC iPlayer, ITV Player, 4oD and Demand 5. You can read our Humax DTR-T1000 YouView box review for more information on the service and if you like the look of it, then enter our competition to win a Humax box.